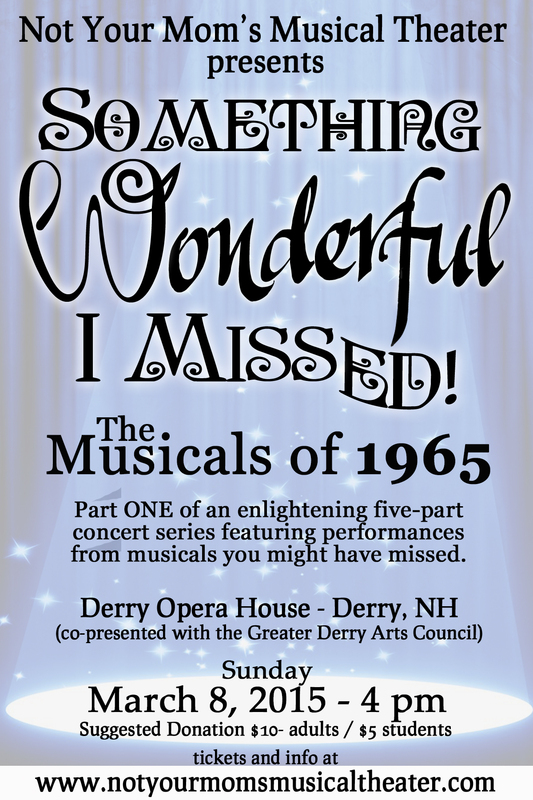 NYMMT is back and better than ever with a 1965 concert that you do NOT want to miss. Hear songs from Flora, the Red Menace, Man of La Mancha, Half a Sixpence, Drat! the Cat! plus great lesser-performed tunes from revivals of Carousel, Guys and Dolls and more! Special guests include Judy Pancoast, children’s singer/songwriter and your favorite Not Your Mom’s performers. Melody Reese debuts with us in this concert – she auditioned for us only a week or so after moving into town! As always, tickets are $10, $5 for students, but they’re a suggested donation – pay what you can and bring some cash for our Audience Choice raffle. Hope to see you soon!